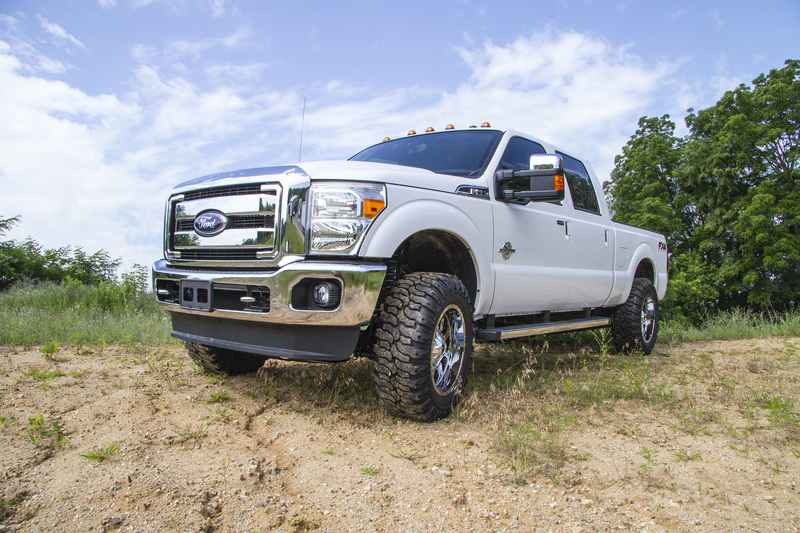 Goldwater, MI – Following last month’s announcement of complete 2.5” Radius Arm Systems for 2011-15 Ford F250 4WD trucks, BDS has packaged the new arms as a stand alone radius arm upgrade available for late model 2005-2015 Ford F250/F350 Super Duty 4WD trucks. These radius arms are designed to correct the suspension geometry when used with 2-4” of lift kits. These massive radius arms are built to handle the use and abuse Super Duty owners demand and far surpass the factory stamped steel arms fabricated from 1.75″ OD – 10GA DOM tubing with support gussets. The arms are formed inward to allow for addition tire clearance of oversized tires and incorporate factory style 3-1/4” rubber bushings to minimize road vibrations while allowing for long, maintenance-free bushing life. The new radius arms are designed as a direct bolt-in replacement for the factory radius arms allowing for quick and straight forward installation. To maintain factory alignment adjustability alignment cam locks are supplied with the arms and install using OE hardware.The arms come finished in a durable textured black powder coat finish with a copper BDS nameplate. These new radius arms are a great addition for F250/F350s running the 2” leveling kit. They should not be used in conjunction 4” radius arm drop bracket kits (bracket must be removed first), but are a great addition to improve the performance over the factory arms when used with the 6” radius arm drop bracket kits. 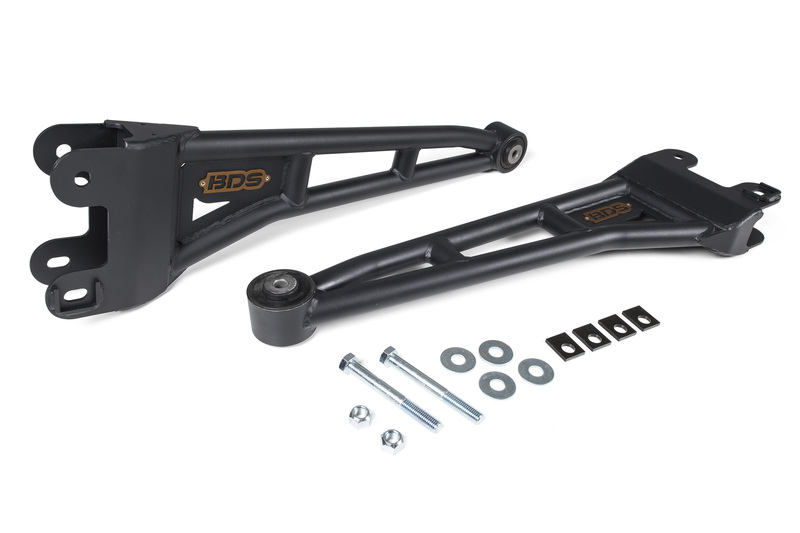 For more on these radius arms and available accessories for your Ford F250/F350 truck from BDS Suspension, log on to bds-suspension.com or call (517) 279-2135. Wanting theses to replace my factory arms. I have a 3.5 rough country lift. Do these move the axle ahead any from the stock location to help with clearance between the tire and fender? Our arms are the same length as the factory arms, but will move the axle forward slightly due to the additional caster adjustment. 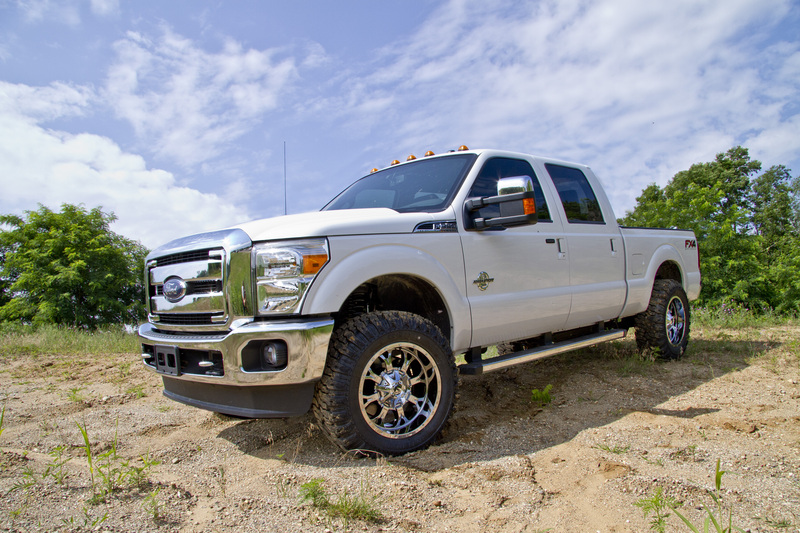 I have a 2010 Ford F250 Superduty with a 6″ lift, will these work on it? These replacement radius arms were designed for 2-4″ of lift, but can be used in combination with our radius arm drop brackets on 6″ lifts to correct caster angle. At the 6″ height your other option is to convert over to a 4-link system for better control, stability, and handling. Our 4-link upgrade is #980H, see more at http://bds-suspension.com/product-display?sr=980H. I have a 2014 F250 with the 6.2 liter gas engine. It has a rough country blocks on the front. Will these raise the front of the truck any more. Are you asking if installing the radius arms will increase the ride height? The ride height is set by the coil/coil spacer length, the radius arms don’t effect ride height, but they are designed to correct front axle positioning, caster/alignment, and strength over the factory arms when used in combination with 2-4″ lifts. Looking at installing a 6” kit and don’t see Radius Arms as an option for the BDS kit. I see other competitors offer a beafy Radius arms with their kits. Is going with a 4-Link system better than the Radius Arms? I don’t plan on any serious off road driving. Hey Allen, thanks for your interest in BDS Suspension. 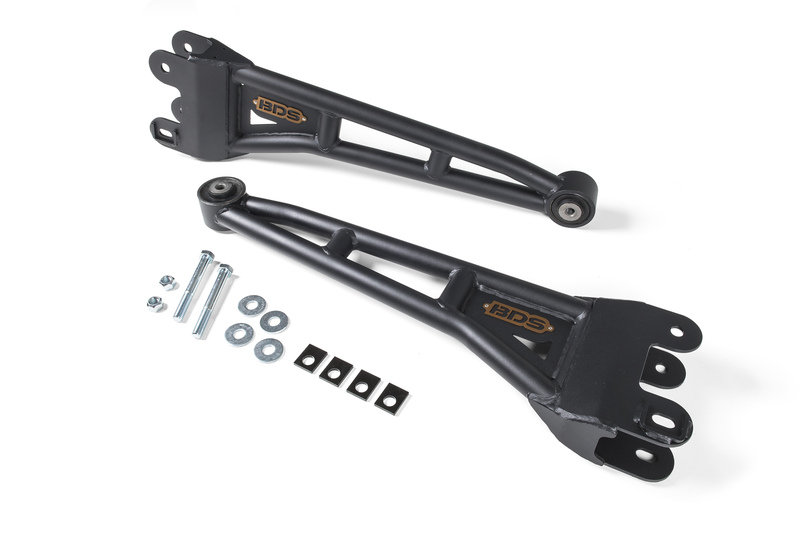 Our replacement radius arms are designed to correct the caster with 2-4″ of lift based on mounting into the OE frame/axle mounts. They can be installing in addition to our 6″ radius arm drop bracket lift kits as the drop brackets for that kit is only 4″ so the radius arms cams would be set up in the 2″ position. These arms are a big upgrade to the factory stamped steel radius arms for increased strength, tire clearance and adjustability to correct caster. That said there are several benefits to to the 4-link over a radius arm (stock or aftermarket). With a radius arm there is only one pivot point so during suspension travel the caster changes. With our 4-link design there are caster change is less than 1-degree throughout wheel travel for improved handling on and off-road. Along with that the 4-link is a stronger design with beefier 1/4″ thick brackets mounted to the frame and more mounting mounts. For more on the topic fee lfree to contact our sales team at (517) 279-2135 or stop by your local BDS distributor (http://bds-suspension.com/distributor-lookup). Hey Carter, I’m curious how much caster these add in. I want to use these in conjunction with the Carli 2.5” leveling springs on a 2018 F250 and need to know if I need to add their caster shims or not. Hey Cody, I checked with BDS tech support for input on your questions. Our radius arms add 2 degrees of caster and have a cam slot for adjustment. On a 2-2.5″ they position the caster slightly over factory specs which is a good thing on the newer Super Duty trucks. I’ve currently got a 2.5″ leveling kit on my truck and after installation was very low on caster, almost dead zero on both sides. If I run these arms set in the cam position for the 3-4″ lift, will it add the extra caster above the 2.5″ lift setting, or will it not work? Also, do these use the stock bushings up front where the arms attach to the axle, or do they come with replacements for the front as well? Hi Steve, thanks for reaching out and your interest in BDS Suspension. To answer your questions our HD radius arms will allow you to correct front end caster positioning with 2-4″ of lift and use a lower cam lock slot for adjustment. The radius arms come with bushings for the frame mount end of the arms and similar to the OEM radius arms retain the OE bushings already installed in the axle. These HD radius arms are a direct bolt-in replacement for the factory stamped steel radius arms on 2005-2018 Super Duty and would be compatible with your current lift setup.Benefits are explained in the announcement above, but to summarize they are much stronger than stock, they are formed for additional tire clearance when turning, and they use a lower cam slot to correct front end caster between 2-4″ of lift. The BDS emblems have been updated since initially launched and now come in a machined finish that will match your BDS steering stabilizer. Hey Jeremy, that’s a difficult one to answer without seeing the vehicle and ultimately would come down to your current wheel/tire specs. 1) Are they 37×12.50 or 37×13.50 tires? 2) Are they factory wheels or aftermarket wheel, what diameter? 3) If aftermarket wheels what is the width and backspacing? 4) Is there any track bar correction with your current 2.5″ kit (if not it would cause the axle to be offset to the side and more likely to rub the control arms)? All of those details will effect the amount of clearance. Our HD radius arms are designed to offer more tire turning clearance than the factory radius arms as well as correct caster with 2-4″ of lift, but its difficult to say how much is needed to clear your current setup.